Tickets £9 on the door, £8 in advance from: Martock News, Martock Gallery or by phoning "Evie" on 01935 829576. Holy Trinity Church, Lysander Road, Yeovil BA20 2BU. YCB make a welcome return to The Octagon Theatre. This year they will be performing music from Fiddler on the Roof, John Williams, Les Miserables, Gershwin, 80's Hits, Benny Hill Theme and much more, also featuring the vocal talent of special guest Matthew Rock. Steve on 01460 271767 or from the ticket reservation page. featuring the vocal talent of special guest Matthew Rock. 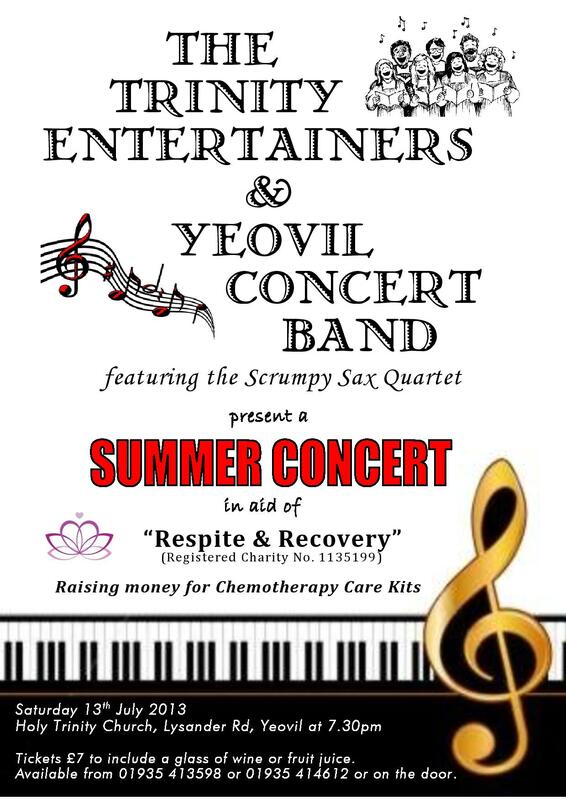 ​01935 429944, www.yeovilconcertband.com or on the door. in aid of "Respite & Recovery"